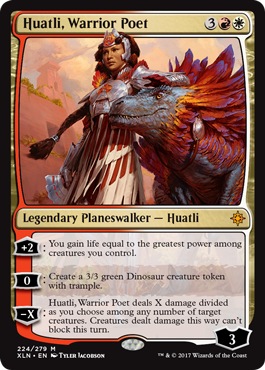 Red and white have each gotten a lot of powerful planeswalker cards in recent years, but the exact red-white combination is still somewhat underrepresented compared to others, so it's cool that Huatli goes in those colors. It's interesting that her three abilities all promote somewhat different styles of play; her "ultimate" is suited to being the last play in a quite aggressive deck, while her zero-cost is a Garruk-style midrange creature advantage ability and her +2 slows the game right down. That kind of versatility is a good thing, and it makes it much more likely that Huatli will find a niche in some deck (or decks). She's not explicitly a Dinosaur planeswalker, but she sure is intended to slot into the deck. Her ult lets you take out three blockers immediately, but if you're not ready to go alpha, you can make another blocker/attacker or gain life. There is synergy in her +2 and her 0 ability (make a Dinosaur, gain 3+ life each turn), and while Huatli isn't flashy, she has synergy with what her deck wants to do. Five mana is again that dead zone for planeswalkers, but I think Huatli offers enough to justify her use as a curve-topper or a midpoint on the way to bigger, fluffier dinosaurs.